SELFIE WALL creates a range of lighting conditions day and night, offering a dynamic and interactive space for self-photography. 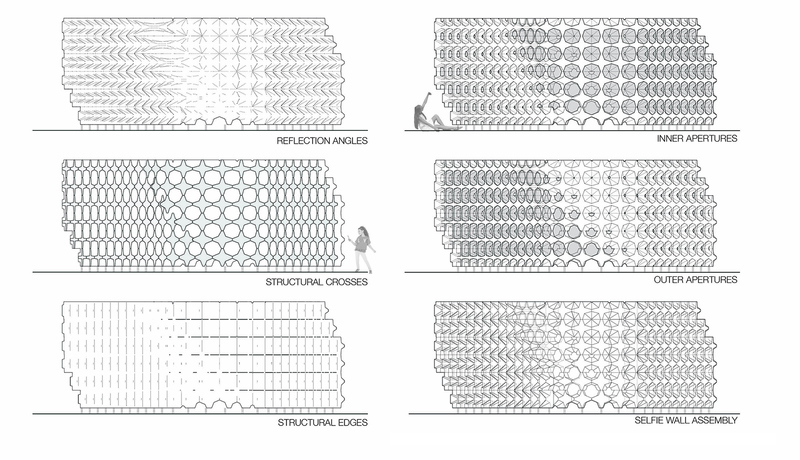 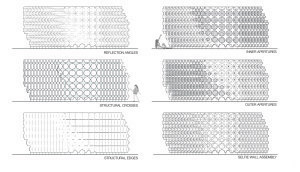 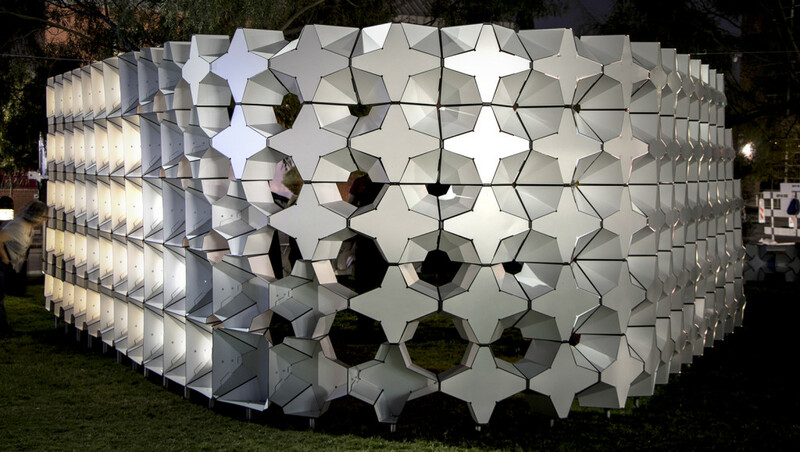 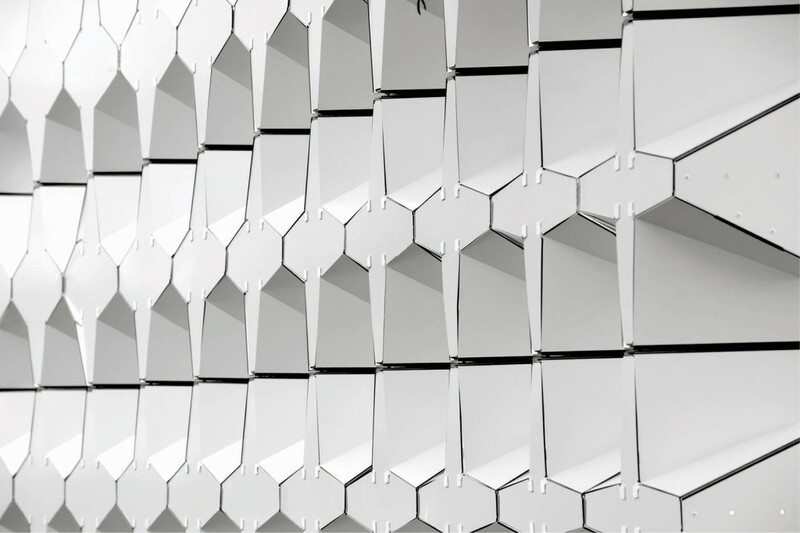 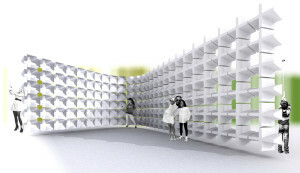 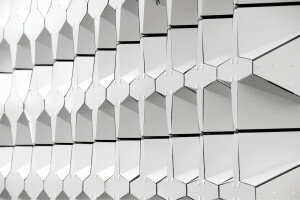 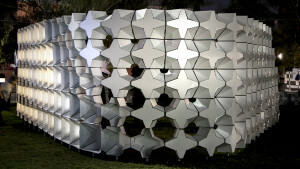 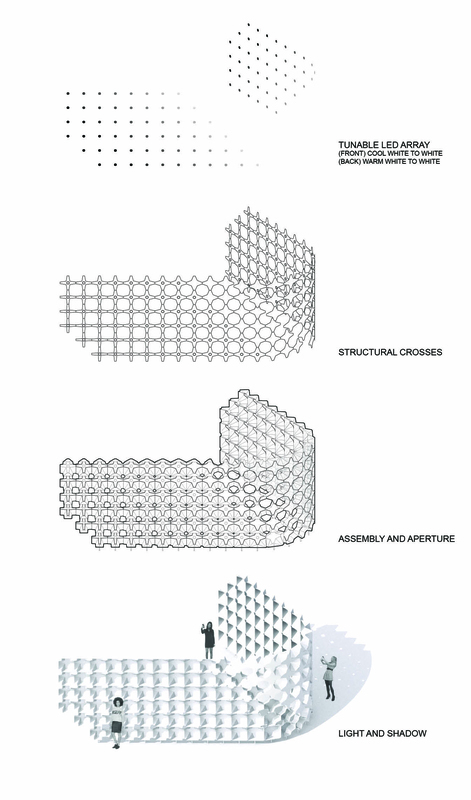 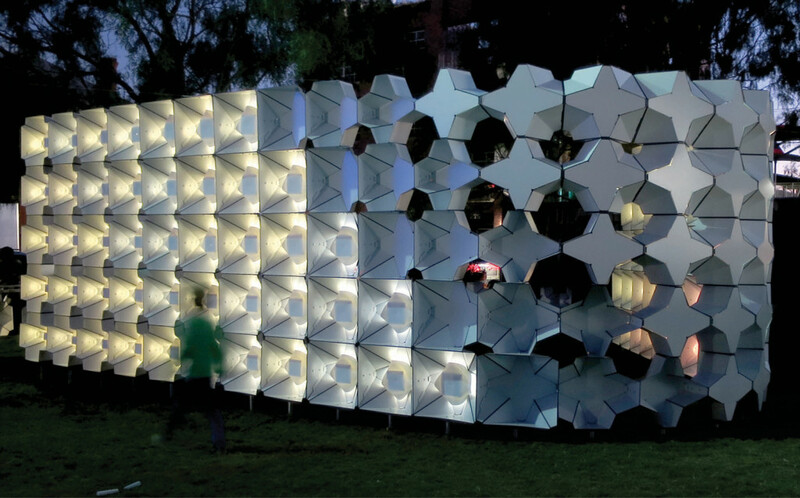 The wall is built from 162 custom-fabricated units, CNC-milled from composite aluminum panel, and folded to shape different apertures for bouncing, scattering, and collecting light. 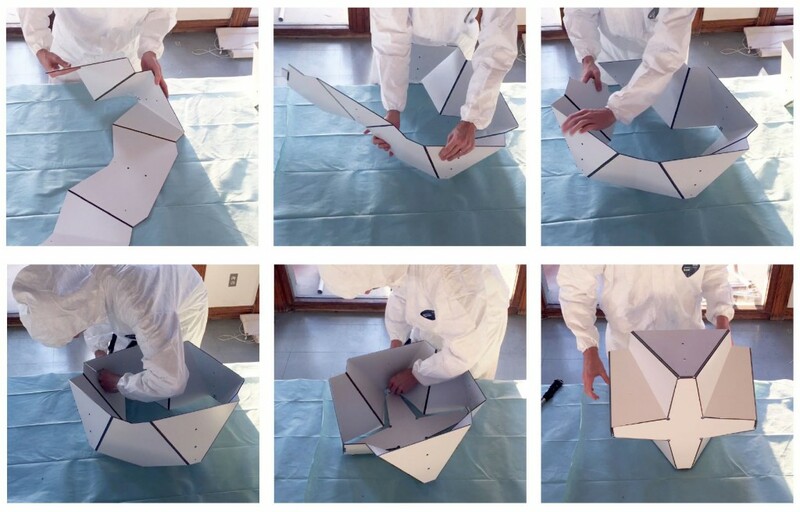 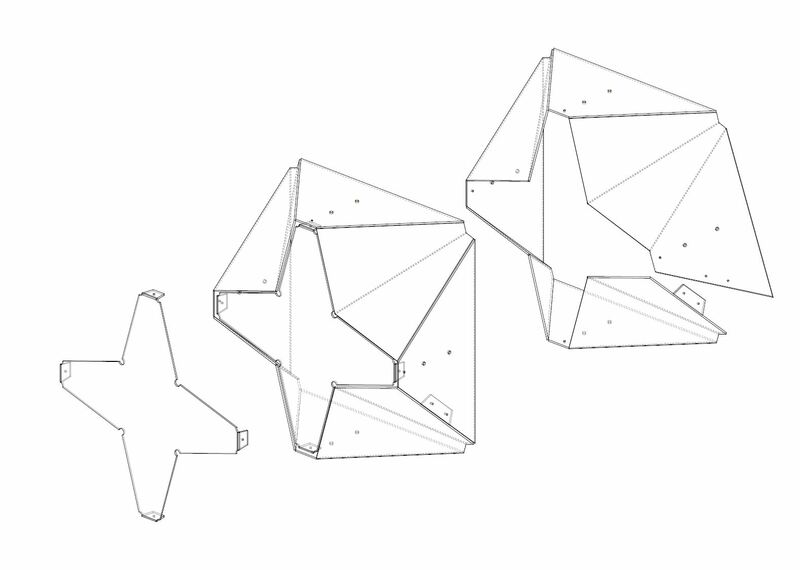 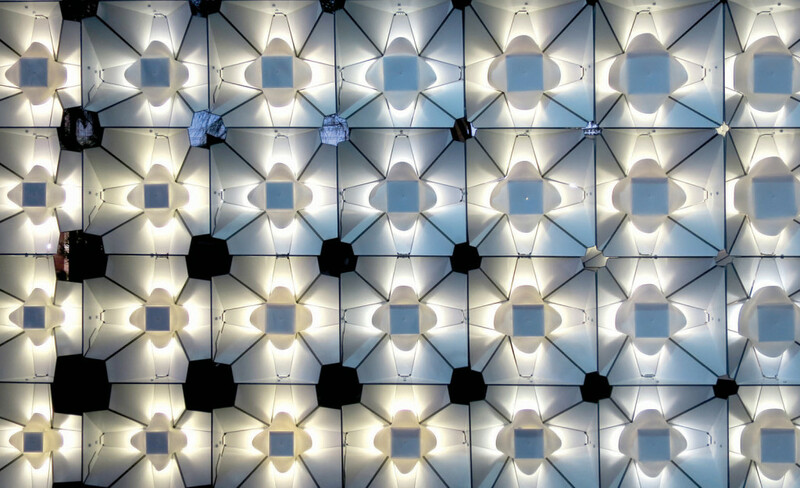 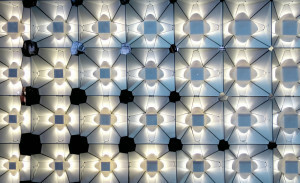 The shape of the modules transforms from a structural cross-shape to a more open ‘umbrella’, providing consistent structural rigidity throughout the wall surface while providing a range of lighting options. 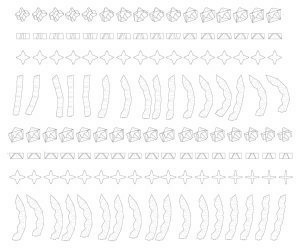 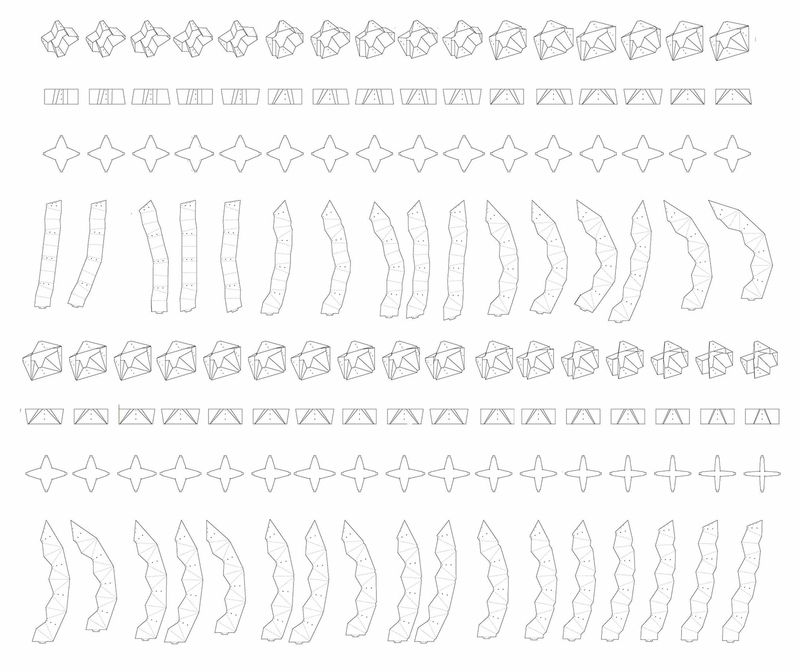 These mass-customized variations evoke, replicate, and evolve lighting solutions across a variety of industries, simultaneously signaling ‘barn doors’ on stage lighting, photo umbrellas used in portrait photography and film, and vanity fixtures. 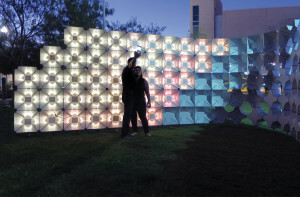 A grid of LED lights is inset to provide zones of different color temperatures at night. 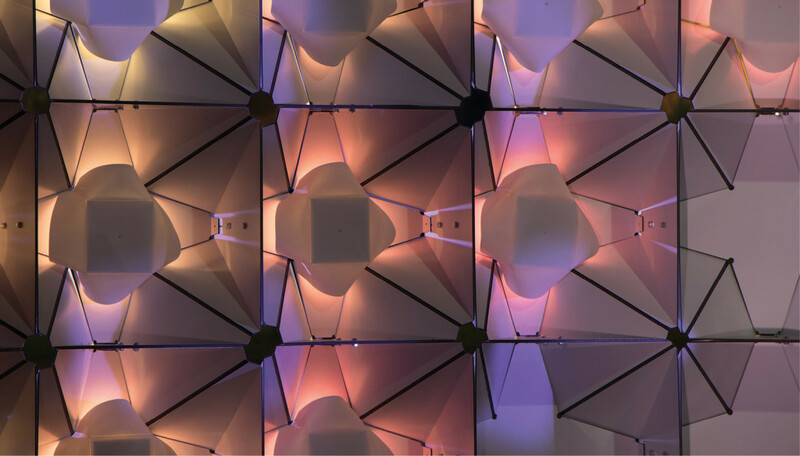 A range of warm color temperatures, flattering to skin tones lines the inner surface of the space, while a range of cool whites provides a more accurate color rendering on the outer surface. 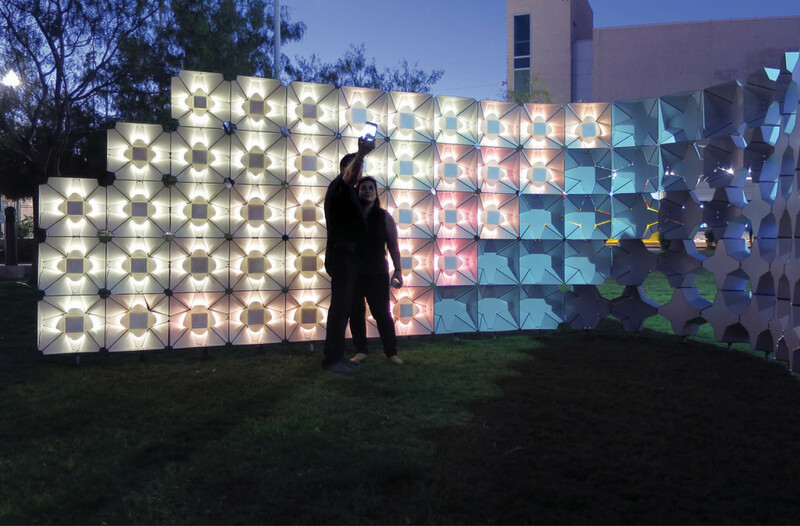 The public is encouraged to explore the dynamic matrix on site, finding the lighting condition and background most suitable for their own self-portrait. 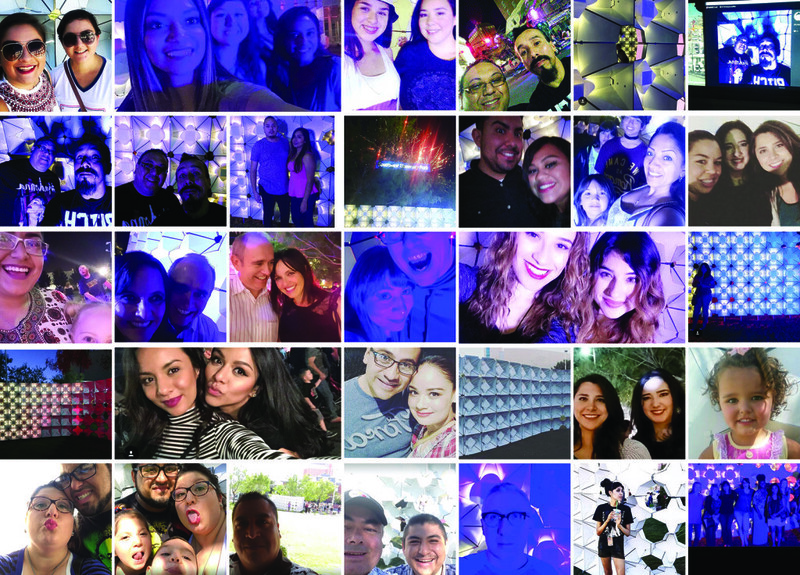 Through an extended online and on-site digital presence, the installation draws attention to the potentials and pitfalls of the vast range of metadata extracted from a still-burgeoning global selfie culture. 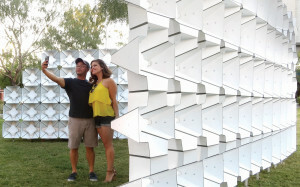 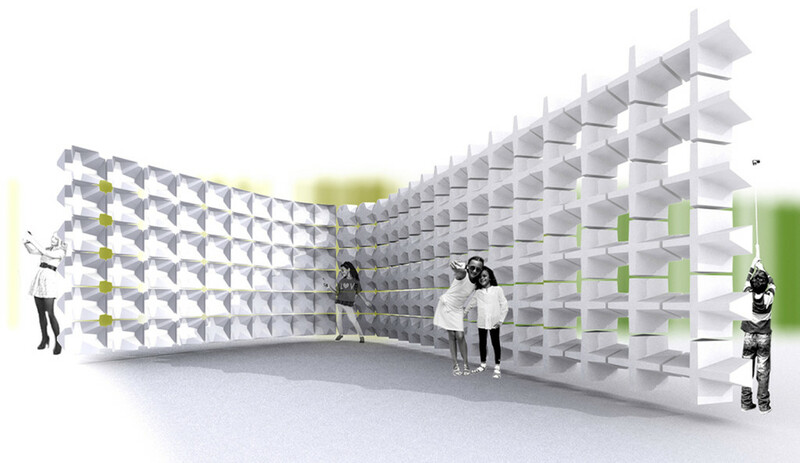 The project extends AGENCY’s previous work, designing new interfaces for self-photography in public space through an invited competition for the Wynwood Gateway Park in Miami. The project is part of an annual event sponsored by the City of El Paso Museum and Cultural Affairs Department (MCAD). 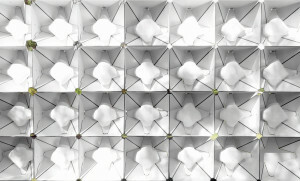 AGENCY is one of five international artists featured the exhibition. 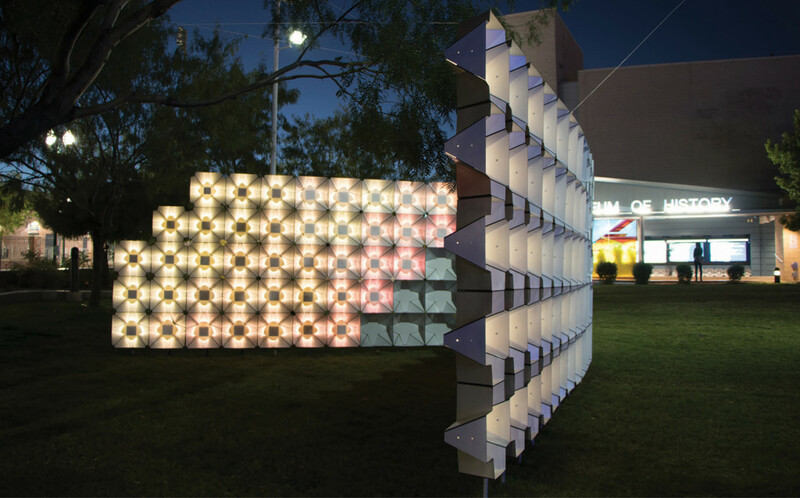 The project is sponsored in part by AIA-El Paso and Terracon. Special thanks to Andrew Lara for additional project photography.